The Long Version: We've all been there: Still in the store parking lot trying to open some cool new device for our cameras or computers, or maybe a new CD we want to check out on the way home. Or it's Christmas Day and a loved one is turning red from frustration (or blood) fighting the tamper & theft resistant plastic clamshell packaging that's everywhere these days. And what about the poor kids hearing all the bad words when mommy can't figure out how to free their new toy right now? I rather admire how Zibra has figured out that there was a problem, then pretty much solved it. 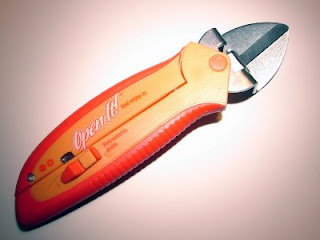 This tool looks a lot like gardener's pruning clippers, but with a few important differences. 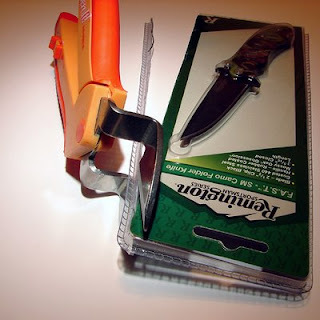 In one handle is a retractable razor blade for cutting wrapping paper, CD/DVD cellophane and tape strips, etc. There's also a tiny flip-out Philips-head screwdriver for certain types of restraints and battery compartments. These are functional but not of high quality and won't last more than a few years in my opinion. But they are just a whistle and a bell. The main bit of brilliance is the Z shape of the cutting blade section combined with a big hole. When you attack a plastic clamshell with the Open It! the bent blades and the hole allows enough room for the complex contour of the package edges to pass through as they are sheared off, and that makes all the difference! See how the cut-off section passes through the blade gap and stays out of your way? I've tried this with scissors and you end up getting stabbed in the hand, then you have to bend it out of the way to continue cutting which deforms the package and slows progress. One clever detail makes all the difference, and I applaud them. Please keep in mind that this was a small pocketknife's packaging--there is obviously plenty of room for the bigger clam's protrusions. The handles are big and comfortable, with a hard rubber no-slip grip and enough leverage to make cutting very easy. The chopping blades are sharp enough for the job but ground at a high angle that makes them fairly safe in households with children, plus there's a lock to keep the handles together when not in-use. The bright orange is easy to locate in a messy junk drawer. Not only do busy moms and grandmas need a product like this, they deserve it. People with limited hand strength and limited tool boxes need one, too. The bottom line is that using this tool is going to be much simpler and easier than any other method of busting open a plastic clam. In a fitting Catch-22, your OpenIt! resides in the exact same type of package it was designed to defeat. Hopefully it will be the last time you'll have to do battle with an annoying retail contraption and possibly lose. Ever gotten deep inside a fairly simple cardboard box and found a stout nylon cable-tie keeping you from finally liberating the object of your kid's capitalist desire?